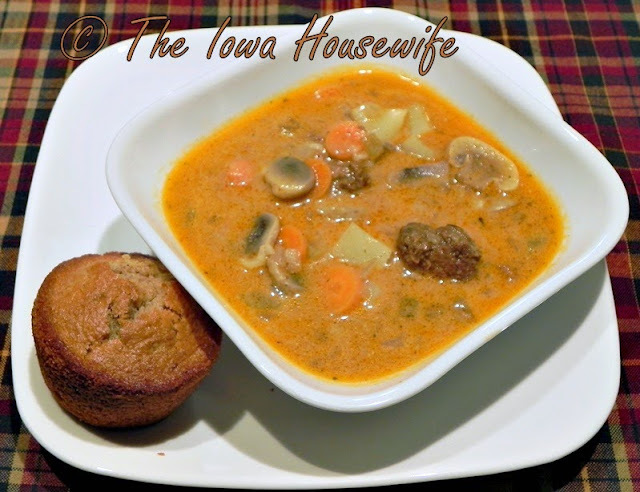 We like soup and this one has everything my husband likes. I occasionally use a pint of Home canned Hamburger Mix instead of the fresh ground beef and tomato paste to make this even faster, along with Home-canned Beef Stock. I don’t bother to peel the potato. Notice that the barley and potato are only half servings; so you don’t really get too much starch. If you don’t like barley (but you’re missing out), try rice instead. In a Dutch oven over medium heat, cook and stir the beef, mushrooms, celery and onion until meat is no longer pink; drain. Stir in flour until blended; gradually add broth. Stir in the carrots, potato, pepper and salt. Bring to a boil. Stir in barley. Reduce heat; cover and simmer for 20 minutes or until barley is tender. Whisk in half and half and tomato paste; heat through. This sounds really good, stick to your ribs soup, just right for the really cold and damp weather we are having here in the south of Scotland at the moment. Really enjoy reading your blog, keep the recipes coming! Thanks Eleanor...good to hear from you!